SATURDAY, April 21, 2018 (HealthDay News) — If you have asthma, it may help to reduce your exposure to allergens. “What many people don’t realize is that the same things that trigger your seasonal hay fever symptoms — things like pollen, dust mites, mold and pet dander — can also cause asthma symptoms,” said Dr. Bradley Chipps, president of the American College of Allergy, Asthma and Immunology (ACAAI). “If you have allergies, and you are wheezing or coughing, see an allergist to find out if you also have asthma,” he advised in an ACAAI news release. “Allergists are also specialists at treating asthma and can put together a treatment plan to help you deal with both allergies and asthma,” Chipps added. Allergic asthma — where allergies trigger asthma symptoms — is the most common type of asthma. As many as 80 percent of children with allergies also have asthma. Also, 75 percent of asthma sufferers aged 20 to 40, and 65 percent of those with asthma aged 55 and older, have one allergy or more. “Effective treatment of allergic asthma includes identifying and avoiding allergens that trigger symptoms. After diagnosing asthma, we usually move on to using drug therapies and developing an emergency action plan to deal with severe attacks,” Chipps said. 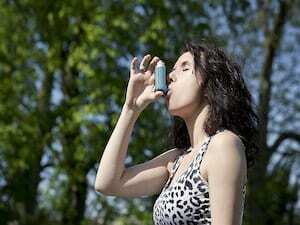 “If you can cut down on the number of allergens in your life, you may also be able to reduce asthma symptoms,” he said.